Charity Overview The NSPCC (National Society for the Prevention of Cruelty to Children) is the UK's leading charity specialising in child protection and the prevention of cruelty to children. Founded in 1884 as the London SPCC by the Reverend Benjamin Waugh, the NSPCC is the only UK children's charity with statutory powers that enable it to take action to safeguard children at risk of abuse The FULL STOP Campaign is the NSPCC's most ambitious challenge since they first started protecting children more than 100 years ago. Their mission is to end cruelty to children. FULL STOP. They believe this can be achieved, but only with the support and commitment of everyone, in every part of our society. ...read more. Their numbers includes the Prime Minister, more than 450 members of Parliament and many celebrity supporters and public figures. 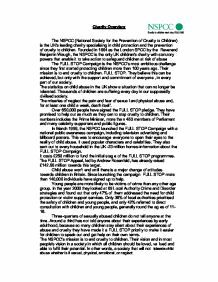 In March 1999, the NSPCC launched the FULL STOP Campaign with a national public awareness campaign, including television advertising and billboard posters. This was to encourage everyone to open their eyes to the reality of child abuse. It used popular characters and celebrities. They also sent out to every household in the UK-23 million homes-information about the FULL STOP Campaign. It costs �250 million to fund the initial stage of the FULL STOP programmes. The FULL STOP Appeal, led by Andrew Rosenfeld, has already raised �142.58 million towards this target. ...read more. Three-quarters of sexually abused children do not tell anyone at the time. Around a third has not told anyone about their experiences by early adulthood, because so many children stay silent about their experiences of abuse and cruelty they have made it a FULL STOP priority to make it easier for children to speak out and get help on their own terms. The NSPCC's mission is to end cruelty to children. Their vision and in most people's vision in a society in which all children should be loved, valued and able to fulfil their potential. In other words, a society that will not tolerate child abuse whether is it sexual, physical, emotional, or neglect. ...read more. On the television, radio or billboards we can't see the important information. I think we should be able to read about it in more detail so we can see what they are really about, and we don't waste our money donating it to useless charities. NSPCC has been successful in creating strategic alliances with well established organisations namely BT, Alliance & Leicester, JP Morgan and Barclays Bank. All these investors hold an influence in the consumers mind and are able to sell the Full Stop concept at a greater advantage. Show how charity advertisements persuade the public to support them. The caption too can be said to be very effective as it is short, direct and affects the reader deeply and quickly. This particular advert was made by a charity called "Help the Aged" This advert is trying to persuade us to pay a small contribution a week to save people like Nziku.